With fewer honeybees these days, it’s time to welcome alternative pollinators into your garden. We’ve all heard the news: Populations of the honeybee are declining. Factors such as habitat loss, pesticide use, and diseases have taken a toll on these heroes of the horticultural world. The story that seldom gets attention is that for home gardeners there are plenty of native pollinators. Roughly 4,000 species of bees are native to North America, including approximately 45 types of bumblebees. Plus, many types of flies, certain wasps, and even butterflies and bats can act as pollinators. By attracting a diversity of these beneficial visitors, pollination in your garden will improve. Thus, yields of crops like tomatoes, squashes, cucumbers, peppers, and berries will increase. You can take three steps to welcome pollinators to your garden. 1. 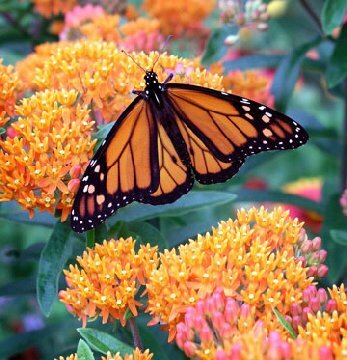 PROVIDE NECTAR AND POLLEN RICH PLANTS, INCLUDING NATIVES AND HERBS. The native pollinators in our region have co-evolved with the native plants, so use native wildflowers to draw them to your yard. To maintain a population of pollinators, it is important to have plants in bloom all season long. Even a small garden can support local pollinators. Herbs can attract native pollinators and provide them with nourishment, too. Native plants are easy to grow because they are adapted to our local climate and growing conditions and, once established, are fairly low-maintenance. 2. ENSURE THAT POLLINATORS HAVE NEST SITES. Many native pollinators nest underground, so have some open areas. Bumblebees often make their homes in abandoned mouse and vole tunnels, while others prefer piles of rock. Small bees may fly only a few hundred yards from their nest when foraging; large bees will travel a mile or more in search of food. Mixing pollen and nectar plants among your fruit and vegetables will keep bees close to the plants you want them to pollinate. 3. STOP USING PESTICIDES. Pesticides are toxic to pollinators. Pesticides should not be used on plants in bloom. If you must, apply pesticides either near dark or very early in the morning. At these times, insects are less active. The best choice is to use natural pesticides and there are many available today. We at Hillermann’s are turning our focus to natural controls in all areas. We can help you.